Looking back through the year I definitely saw a lot of huge hits. The Giants won the World Series, UH won a few football games, gas prices went way down, the nightlife didn’t collapse. Looking back through the year it was a series of many greats that make me feel so very lucky to be able to live in such a snug yet thriving city. Emotionally I would say this was a fantastic year for me. I took ownership of decisions I made and it changed everything. You could say I stopped trying to please everyone. I realized you can do everything for other people and that doesn’t mean anyone will ever be there for you if you need them. It’s not necessarily a bad thing, it’s actually human nature. Humans fundamentally try to get the best they can for themselves using whatever means necessary. Still, that’s no reason to spin my wheels. I’m just more aware of my actions and who I am looking out for. There are so many people who work hard and deserve to be recognized, and there a lot of others that will take take take until you are sucked dry leaving you feeling empty. Once we can see clearly who those people are and step around them to the virtuous ones what a beautiful city this can be. Sure, it’s cute and eye-catching to have a ladies night with scantily clad women on the flier, but how about a ladies night where the women are also the DJs providing the entire night’s soundtrack? Doing what they do best; running sh*t. Bravo to ChittyBang, last year’s Best Party for paving the way for many others to follow suit and see how amazing it can be. Congratulations to Addiction Nightclub who started a new monthly this year featuring an all-female guest DJ lineup for their So Fancy! 2nd Thursdays. It not only brought in a whole new crowd to the club, it switched up the music programming from 100% hits and hip-hop to more house and dance music, and provided a memorable night for some of the KTUH DJs that were given an opportunity to play one of Honolulu’s hottest clubs (anyone who caught Jem’s set is probably still reeling). It’s a baby step to widen that “mainstream” gap but also a brave one for any club to take a couple of steps outside the box. Promoted by Amp Industries and Angel Deihl, they built an tremendously fun ladies night complete with a beauty bar and live photo shoots, and provide a showcase for up-and-coming house DJs to play out on one of the best sound systems in Honolulu. The best part? Their crowd of regulars is two-thirds women that are fun and love to dance. I call it the city’s best un-kept semi-secret but expect this to blow up even more in 2015. Their strict music programming will keep the “mainstreamers” away and the women happy and dancing. I love it. Bringing out the Soulection crew, consistently putting on amazing shows all year, befriending the most elusive yet most respected electronic musician that resides in Hawaii Mr Aaron Carmack, and bringing so much more awareness to Jon Cozy’s Green Leaf Check to corner the underground music scene with a solid foundation, Riana hasn’t just pushed the boundaries of talent, she is on a whole new level. All while running About the Goods and making a huge name for herself as a multi-faceted DJ. I would ask her where she finds the time to do it all but I totally get her. There are just some people that are wired that way and it’s their calling to do as much as possible. Up and coming fashionista, blogger and never compromising disco kid, Gnaraly reminds a lot of the older generation of partiers of the thirtyninehotel crew. She was there back then; snapping away and casually will make posts to remind everyone of that spirit that can never be replaced. You might have seen her spinning all vinyl at the Iron DJ, Bevy Bar, or guest slots at eleven44. You can find her photo blog to be a bit addicting as is her overly-energetic demeanor. Watch this one in 2015. “EBC” is the Electronic Boat Cruise party on the Waikiki Ocean Club (formerly known as the Red Dolphin). The Waikiki Ocean Club is that amazing double-decker boat complete with a bar that can fit a few hundred people. I can’t even tell you how many promoters have sucked in their teeth after getting so excited to try to do a rager on that boat only to find out the steep price tag. You would have to sell tickets for over $60 to even break even and who is paying that kind of money for shows anyway? Enter: Matt Baumer. He has now made two attempts to bring the EDM crowd out to sea and while they could do with another couple hundred people onboard, the parties are getting great reviews. There is so much potential with the beautiful top deck, the grimey bottom deck, and so much room to hang out. I’m hoping for more of these parties with more people in 2015. Buho Cantina’s patio is perfection. It’s exactly the “rooftop” vibe we’ve all been waiting for, and it’s HERE. The fact that owner Hide Sakurai and Marketing Manager Justin Mizfuka went to Los Angeles and were deeply inspired by what they’re doing at the Ace Hotel only means they are planning on bringing a major wave of cool to Waikiki. The ambiance is unbeatable, now it’s just time to start getting those parties going regularly. I’m not talking about “EDM” which is to house music what the Kardashians are to Television. It’s O.K. that we haven’t caught on to what the rest of the world outside America has known for decades; it’s only just starting to penetrate New York’s nightlife so it may never reach our shores enmass. 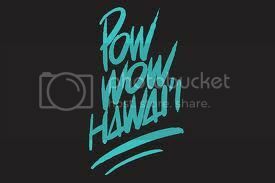 Still, the fact that Hawaii has an underground scene that has been keen to this for many years and made a name for itself across the globe as THE top spot for deep house and techno 6 years strong is something that should have everyone holding their head high. This is huge, whether we know it or not. Bruno Mars and Mark Ronson’s performance on SNL’s Thanksgiving episode will forever go down in history as the night my heart swelled as I realized popular music has a chance in these coming years. Bravo to both of them for bringing back such a beautiful style of music that is so authentic and soulful. Real instruments, real singing, real dancing, a real performance. Landon Tom was one of the city’s greatest musicians circa The Jump Offs era. He has taken some years to work and go to school but when you’ve got something inside you that needs to be expressed sometimes the only thing left to do is just that. His brand new band, known for two seconds as “Only Child” now called “Human Lion” has already performed for two sold out shows opening Young the Giant at The Republik and isn’t slowing down any time soon. That is, as long as his bandmates don’t plan on moving away. If you can do it better than you do it. If you have time to rant about you aren’t using your time wisely. Destroying parties and clubs when those animal instincts take over, it left a haunting mark on a lot of us seeing one of the cities greatest female DJs get hit in the head with a bottle while she was working. Enough is enough, people. Clubs and bars need to do more 86ing. With photos. There’s Internet now can we put some of these troublemakers on blast for once and for all? It’s a given that it will happen, but 2014 was the year that too many people in my very close, very small inner circle moved on to bigger cities to be the amazing people they are. It’s made some of my colleagues look at me to see if I’m next. The answer to that is a huge no. I moved to Hawaii after already living a hundred lifetimes, and my only goal was to make a life here. That is good enough for me. For now. Even though this small, stylish club was opened by nightlife veteran Aurora Group (Bar35, Du Vin) we weren’t certain about their future over there on Bethel street as they opened with wavering legs trying to find their place in the nightlife scene. After a few attempts at giving people what they thought they wanted they connected with some forward thinkers that are giving people what they need. It’s working. Congratulations guys. I’ll disclose that I was involved with some of this but definitely not all. You guys that are working hard are my biggest heroes. If there’s things I’m missing even though I’m out all the time and online the rest of the time now is a great time to point it out. People working hard deserve to be recognized. Awesome list! But where’s the Hip Hop or beat makers category? Nice list CW good job always building up not down. All the best for a Happy 2015! TY Jayson!!! I’m gonna work hard this year you watch. Can i get Best MIA in 2014?